If you want a tool with which you wish to find and manage Apple Mac book’s battery life then with a software tool called Coconut battery is a right tool with which you will be able to manage and monitor the battery life of the Mac book Laptop. This software tool shows you the current charge of your battery along with the maximum battery capacity along with the original capacity your battery had as it left the factory. Also additionally it also gives the information about the battery load cycles which most of the softwares don’t give this information which exactly tells that how many times you have fully loaded your battery and also if you plug different charger into the Laptop then it also lets you know about the same and warns that the charger which is inserted is not the one which is required to use the same. With a neat, simple and easy to use interface of this software tool, you can easily find out all the info about the battery. 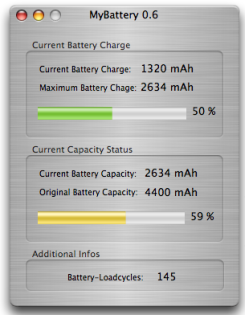 Also, the current maximum capacity of the battery is shown in the interface itself just with the help of a click. Basically, this software data makes use of technology which is named as Core Data which makes the realization of the battery saving option. So, with the help of Coconut battery all the information regarding the battery current health will be on your finger tips and also it shows the live information about the battery which is often charged and also how the maximum capacity of the battery has been used along with the original capacity, so that you can see all the changes which have been made so that you can have a check on the health of the battery over time to time and that too in a simple interface. This coconutBattery_2.7 software tool supports MacBook/Pro/Air, MacOS X 10.5 or higher version.